Blowing Bubbles… Some equipment is more important than other. Like the Engine. In the beginning of this week the Alunauts delivered a great looking powerboat targeted at handicapped people. I was glad to see it go, because I was hoping that there would be more people for Journeyman work. But for various reasons there are still only 2 people working, so progress since the hull roll-over has not been so quick as I hoped. But the anchorbox has been fitted and the first plates of the deck. 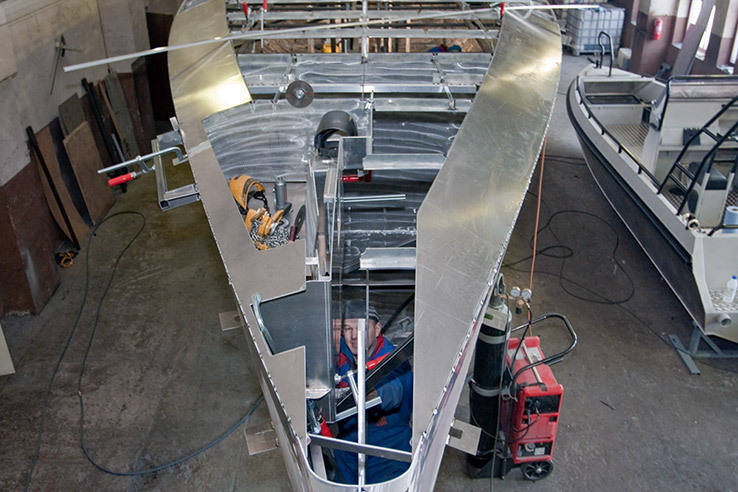 But now I am really longing for having the deck plates in place, because it will mean that all the temporary steel bars inside the hull can be taken away and it will be possible to actually walk around inside the boat! Well, the last of extra urgent various reasons rolled out from workshop today between 8AM and 9AM :) I hope the boatshows in Göteborg, Stockholm, Helsinki and Amsterdam will be fruitful for us and we dare to increase the labour rescources. Monday and tuesday are yet little bit disturbed by a turbulence of several boatshows where Alunaut is directly or not so directly represented, but anyway, the start for final spurt in metal works will be given this Monday. PUBLIC REQUEST from Estonian boaters community website http://www.kipper.ee : Why the deck edges are tilted and why the rest of deck is flat? Do not ask why estonian fans are not asking directly. I don’t know. Maybe they are shy :-) ? Anyway: The basic reason for the deck shape is to get extra headroom in the interior, without raising the gunwale to an ugly height. I wanted to avoid the traditional raised salon roof with windows, which looks old fashioned and does not fit well fit the large deck-house. At the same time keeping the gunwale low is very important for the looks of the boat. Extra benefit is it will be easier to walk along the windward lifelines when heeled, and this is the preferred route when going forward at sea. Best of luck to you and keep those posts coming!